Ithell Colquhoun was a surrealist painter who became increasingly interested in the occult and arcane esoterica – to such an extent that she was expelled from the English Surrealist Group in 1940 – which must have taken some doing. She was a member of the Druidic Order, and the one to which WB Yeats belonged: Stella Matutina. The Goose of Hermogenes (1961), also published by Peter Owen, is her work of surrealist fiction. She writes here, describing herself as ‘an animist’ rather than a ‘pantheist’, of the mystical qualities of Cornwall, in particular in the wild, rugged landscape of West Penwith, where she kept a studio in the 1940s and moved there permanently in the fifties, partly restoring a near derelict hut at Vow Cave near Lamorna. It’s this move that forms the backdrop to The Living Stones. She writes with passion and poetic fervour about the dramatic windswept moors, with their standing stones, strange stone circles still fizzing with atmosphere and mystery, the outcrops and huge granite boulders that look sculpted by some ancient surreal artificer, redolent of an ‘unattained past’. It is not so much that individual buildings are haunted as that the valley itself is bathed in a strange atmosphere. The weirdness spreads up through the Bottoms to Tregadgwith and up through that more open branch of the valley which runs under Bojewan’s Carn, spreads, indeed, all over West Penwith, thinning out here, coagulating there. One could make a map with patches of colour to mark the praeternatural character of certain localities, but these would intensify rather than vary the general hue. So it is not surprising to find eerie places beyond the confines of Lamorna. The life of a region depends ultimately on its geologic substratum, for this sets up a chain reaction which passes, determining their character, in turn through its streams and wells, its vegetation and the animal life that feeds on this and finally through the type of human being attracted to live there. In a profound sense also the structure of its rocks gives rise to the psychic life of the land: granite, serpentine, slate, sandstone, limestone, chalk and the rest have each their special personality dependent on the age in which they were laid down, each being co-existent with a special phase of the earth-spirit’s manifestation. West Penwith is granite, one of the oldest rocks, a byword for hardness, endurance, inflexibility. That is the fundamental fact about Cornwall’s westernmost hundred, and, unless you like granite, you will not find happiness there. It’s not just the prehistoric aura that she describes; she also writes well about the Celtic Christian layers of mystical presence in Kernow. She cites the old saying, ‘there are more saints in Cornwall than in heaven’, and has clearly researched meticulously those saints, many who crossed from Ireland (in St Piran’s case, by means of a highly unorthodox millstone), and gave their names to so many towns, villages and hamlets. She likes to speculate on the pre-Christian origins of many of the places made holy by these Celtic missionaries – not only the churches and chapels but also the caves and especially the wells and springs with which the county is liberally supplied. She writes of a group of free-thinking young people, nowadays we’d probably call them travellers or hippies, who try to establish a sort of commune near her hut. It doesn’t end well. She also records, with varying levels of approval, some of the traditions and festivals of the region, from the Obba Oss of Padstow to the Furry Dance of Helston (Flora is a more modern invention that obscures its misty Celtic origins). She describes the bards and their Gorsedd (the Cornish equivalent of eisteddfod), the Arthurian legends that intrigued Lawrence (not surprisingly she can’t abide the modern commercial exploitation of Tintagel with its ersatz tourist tat). The track here was dank, shadowed by soughing trees full of violence and sadness. I hurried upwards, relieved to get clear of the valley. How much primeval gloom can still lurk almost within earshot of a busy road! See: she does have a sense of humour – though there’s a lot of grumpy railing against the barbaric incursions of modern consumerism: she hates the blare of radios and polluting racket of trippers’ cars. Most of us in Cornwall, I’d have to admit, have been guilty of this kind of curmudgeonly intolerance of incomers as we commune with our pilgrim saints and haunted moors and chough-guarded cliffs, with that ‘tingling magnetism’ that flows along this landscape and that Colquhoun felt and loved. PS: There are interesting woodcuts by Colquhoun at the end of every chapter, and several WG Sebald-esque grainy black-and-white photos. I’d be grateful if anyone could tell me how her name is pronounced; is it similar to ‘Ethel’? or ‘eye-thul’? The guide at Tate St Ives who showed a group of students and staff around the recent Virginia Woolf exhibition (I wrote a post about it here) pronounced it (for there were several of Colquhoun’s surreal landscapes in the excellent exhibition) somewhere between these two possibilities. 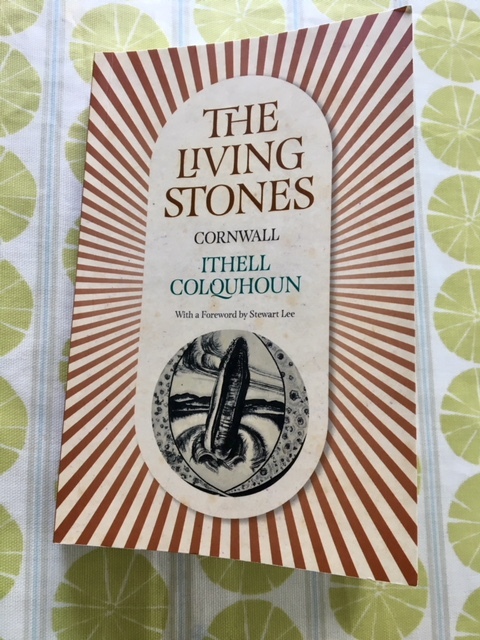 This entry was posted in English Literature and tagged Cornwall, Ithell Colquhoun, Lam, Lamorna, Peter Owen Publishers, The Living Stones: Cornwall, West Penwith by Simon Lavery. Bookmark the permalink. I didn’t know you’d lived in St Agnes! When did you emigrate? What a lovely post and I know loads of people who would love to (or have probably already) read this. I used to be guilty of curmudgeonliness when I lived in central London, so when in tourist spots I try to blend in and shrink back and not annoy! Thanks, Liz. 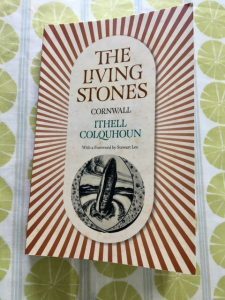 I hadn’t heard of the author/artist until quite recently, so I was pleased to find she had so many new things to say (new to me) about the culture and heritage of Cornwall. Oh dear, I meant the remark about curmudgeonliness as a joke – I don’t like the local pejorative term for holidaymakers/incomers: ’emmets’ – an old word for ‘ants’. It’s mean and xenophobic, but often heard, especially in the summer season. If it weren’t for the visitors the local economy would take a huge hit. Most of us know secluded places away from the tourist honeypots where we can avoid the crowds if we want to. I took it as a joke, don’t worry! We go to Penwith out of season, anyway, so help the economy while blending in and eating the giant meringues. I’m pleased to hear it, Liz. Have you been to the Kurt Jackson gallery at St Just? Wonderful. And Cape Cornwall is one of my favourite spots – and again, oozing with atmosphere. Choughs there are a bonus. I posted about it a while back. No, I spent my whole time in St Just in the Cook Book Shop buying books and having tea! I love West Penwith in its entirety. Your review gave me such a yearning to visit Cornwall ! Where I live I miss the granite boulders, the moorlands, the heather and the gorse…this book should be right up my street. Whenever we are holidaying in Brittany we usually spend a day on the Island of Bréhat, just off the coast from Paimpol. Paradise on earth…except in August when hordes of tourists disembark and all but turn it into hell on earth, leaving their rubbish any old where…so, no, I don’t feel guilty of being “curmudgeonly intolerant”. In Brittany, locals (at least, my husband’s family) call them “the savages”. I think that’s quite appropriate :-). I know, I’m feisty. Must have a bit of Celtic blood in my veins ! West Penwith is completely different from the rest of the county, let alone the country. It really does have a brooding atmosphere – IC may overdo the mystic-occult element a little, but there’s some validity in her account. Lawrence felt it too. You feel it wouldn’t be strange to see a ghost of a 200-yr-old tinner or hard rock miner striding across the blasted heaths on his way to work. Or a mastodon. Many of those weird boulders look like they could well have arrived where they appear as the legends and myths explain: hurled by giants from St Michael’s Mount, for example, or some other irascible spirit of the place. Btw, IC is very good on place names and their origins – mostly Celtic, of course. I should have mentioned, Izzy, that your comparison to the coast of Brittany is apt; I often think, when looking at the dark, craggy cliffs of the Cornish coast, of Chaucer’s ‘rokkes blake’ in The Franklin’s Tale, which Dorigen gazes at with such dread and foreboding as she awaits her husband’s return by sea. I’ve not been to Brittany, but I’ve heard that it has many topographical as well as linguistic-cultural similarities to Cornwall. I’m sure it’s just as magical place for a holiday. Well, Brittany offers a diverse range of landscapes. Finistère nord is more rugged, sometimes gloomy and can sometimes appear gloomy. The granite there is grey and craggy. The Côte de granit rose, as its name suggests, boasts wonderful pink sands and huge rock formations with funny shapes, especially in Trégastel and Ploumanach. It’s more cheerful. I’ve never been to Finistère sud and Morbihan. Can’t say I noticed anything untoward! And I should have thanked you for the topographical guide – fascinating. Must go to Brittany one of these days. “[T]o such an extent that she was expelled from the English Surrealist Group in 1940 – which must have taken some doing. You have reached Peak Lavery with that remark. Love it! a.) “Furry Dance of Helston ” — made me think of the underworld of “furries” and their conferences here. Not sure how active they are in the UK. b.) I think the Celtic mystic thing can definitely go far overboard into tweedome, but I do remember (may have even mentioned it to you before) that the atmosphere around the Stones of Dombeg in West Cork caused a group of high-level yogis (who supposedly have very “open” chakras) to develop intense sinus headaches and nose bleeds. The whole idea of “lee lines” and areas where the “barrier” is permeable carries across groups of people. Sedona, Arizona, and Ojai, California, where spots that native Americans traveled to to access the spirit world. There is likely a whole branch of physics out there we know very little about yet. Cheers, Simon. America (especially the America susceptible to Barbara Cartland novels) is losing its collective mind about the upcoming Royal Wedding, I suspect the attitude in Cornwall is a bit less daffy! Ah, thanks, Maureen, I’m delighted you liked the piece. Yes, you’re right about ‘furry’; IC speculates about the folklore origins of this term. And I agree about that aura thing around sacred sites – Mrs TD, our dog and I felt it when we passed her (the dog, not my wife) through the stone of safety high on the moor above Penzance, Mên-an-Tol. The stone is a large granite ring set on its edge; legend has it that locals would pass their babies through it to protect them from illness. Worked for our dog: she lived to a good age. But we all felt pretty spooked up there. I’m sure the secret rock in Australia gives off similar emanations. And, to coin a phrase re the wedding: frankly my dear, I couldn’t give a damn…Cornwall is hardly in a state of collective frenzy. Wow. That is a neat tale about the stone of safety above Penzance. I had a VERY odd experience in Fall 1991 at the Holocaust Memorial, in Paris. It is a trianglular, stone underground bunker, jutting into the Seine just behind Notre Dame. It contains large casks of earth from each of the major camps. I distinctly noticed a lack of birdsong in the immediate area, and several dogs who visibly shied away from going near the area and I sensed an intensity in the air as well, but it was the animal reaction that was most noticeable. Perhaps a combination of the earth and the deep emotion embedded by visitors there? Not sure. Great post! I knew the title had a familiar ring to it, Simon, and now I know why! I suspect I would resonate strongly with a lot of what is said in this book (and how its written). We spent a few days in your area last month and I was struck by the differences between there and here (in the east of the county). A different world! That said, I find ‘atmospheres’ almost everywhere here: Cornwall has something that I’ve not encountered anywhere else that I’ve lived. I think I must have a Cornish soul … though I have no evidence of it, I feel sure I must have Celtic ancestors! 😉 As for incomers and emmets – and I count myself as being both at various times – I can understand the occasional bout of curmudgeonliness; I’ve been guilty of it too when fighting my way through the throngs in Looe in August! We have never yet encountered an unfriendly or unhelpful local. Sandra: thanks. Many people who come here from elsewhere feel a similar affinity: Lawrence did (until he fell out of love with the place; unfriendly locals and police/military didn’t help – as I explained in my posts about him and Cornwall a while back.) The new extension that housed the V Woolf exhibition is amazing, too. And I agree – the extension is stunning. Seamless addition which transforms the building and the experience of viewing there. The cottage where he and Frieda lived is hard to find – I managed once but have since lost its whereabouts. It’s just outside Zennor – the setting for his story ‘Samson and Delilah’, which is mostly set in the village pub, real name the Tinner’s Arms; DHL stayed there before he found the rented cottage – so all this adds further layers of atmosphere to the already atmospheric area. Hope you enjoy the posts about all this.